← SF Forest Alliance Sent 1700 Signatures to Mayor Lee! In November 2014, San Francisco Recreation and Parks Department published an upbeat progress report on their project to reintroduce the Mission Blue butterfly to Twin Peaks. This butterfly is an endangered subspecies of the not-threatened Boisduval’s Blue. The project staff (SF RPD and outside consultants) have been transporting specimens to Twin Peaks from San Bruno mountain, which has the largest Mission Blue population. 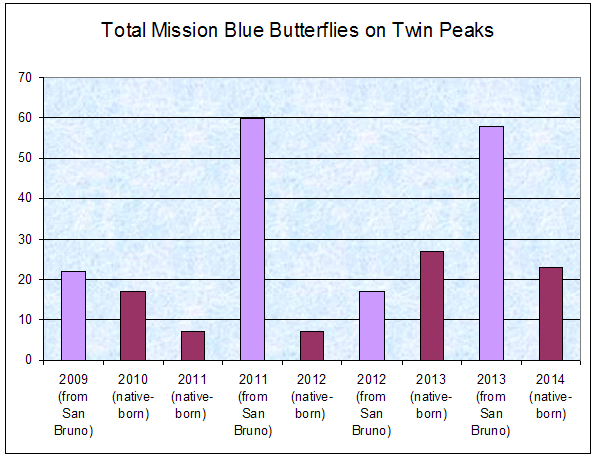 The graph below shows the total number of butterflies introduced from San Bruno mountain (light purple) and the butterflies born on Twin Peaks (dark-colored columns) by year. Of course, the dark-colored columns only count the butterflies actually observed; the actual number present is probably much larger. We’ve been following the multi-year project and reporting on it from time to time – HERE (March 2013), HERE (April 2011) and HERE (June 2010). Our own assessment is more tempered. The project started some years earlier, with three kinds of lupine being planted on Twin Peaks. Lupine is the nursery plant of the Mission Blue – it’s the only plant on which it’s know to lay its eggs and which the caterpillars eat. Lupine planting continues. Mission blue eggs hatch into caterpillars which eat the lupine, shedding their skins as they grow. The larger caterpillars are tended by native ant species, who protect them from predators while benefiting from “honeydew” – sugary caterpillar pee. When they’ve grown to their full size, they form their pupae near the base of the plants, or even on the soil beneath, and remain there for months (in diapause). They hatch into butterflies in spring, sip nectar from a range of flowers, mate, and lay eggs on lupines. In 2009, the project staff moved 22 female butterflies to Twin Peaks and caged them over lupine plants until they laid their eggs. They hoped the butterflies would go forth and multiply. Only a small number made it. In 2010, NAP observers counted 17 adult butterflies, and 14 larvae. This was not a self-sustaining population. In 2011, they spotted only 7 adults of which two were females, and 3 larvae. So they got US Fish and Wildlife Service permits to take more butterflies from San Bruno Mountain – 40 females and 20 males – which they released in May 2011. In 2013, they saw a total of 27 native-born butterflies, of which 6 were female – and 5 larvae. Then they caught 38 female and 20 male butterflies on San Bruno mountain and released them on Twin Peaks. Follow-up surveys observed a lot of eggs – 1120 – on Twin Peaks – much more than in previous years, when the highest number observed was 273. The large number of eggs seen in 2013 didn’t pay off as a population spike – the number of butterflies born on Twin Peaks didn’t go up in 2014. The attrition rate from egg to butterfly is high, because of everything from predators to disease to parasitoids. And bad weather. 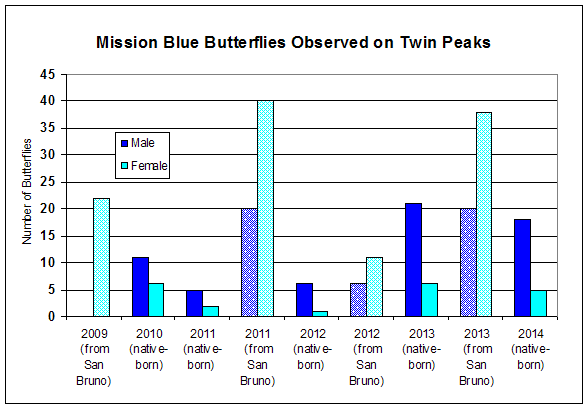 In 2014, they saw 23 native-born butterflies on Twin Peaks (5 female). This was despite spending more time looking than in the previous year (9 visits instead of 5) and going across the whole season. Since they didn’t move any butterflies from San Bruno in 2014, and so were not spending time capturing butterflies, project staff could spend more time observing them on Twin Peaks. Based on their experience on San Bruno mountain, the project leaders believe that this sample indicates that Twin Peaks has between 137 and 274 butterflies, of which half would be female. So here’s the big question: Is the Twin Peaks population of the Mission Blue reproducing and expanding? Or is it dependent on continuing transfers from San Bruno mountain? With a sample this small, it’s difficult to tell, and the project staff note that their methodology is a work in progress. The population estimates could change. What is clear is that the current situation is marginal. The project staff plan to get USFWS permission for another transfer of butterflies from San Bruno mountain in spring of 2015. Some good news: 55 Mission Blue caterpillars were spotted in 2014, compared with less than 15 in all previous years back to 2009. And – an ant was seen tending one, which is encouraging. Ants help to fend off parasitoids. It’s hard work maintaining habitat for the Mission Blue, for several reasons. Lupine is a plant of disturbed areas. It tends to die out in more stable environments. So to maintain lupine, SFRPD will have to keep planting it and creating the conditions it needs, including watering it for the first couple of months until it’s established. The butterfly stays close to home, so they need to plant a lot of lupine so they don’t have fragmented populations. Most don’t travel further than 600 meters, according to the USFWS. The butterfly prefers areas with short grass where the lupine patches are visible. Volunteers have been trimming the grass around the lupine patches. With natural succession, grasslands tend to become scrub. Keeping them open as grasslands means a battle with shrubs moving in – very often the coyote brush. Ironically it’s a native plant, but SFRPD has removed 5000 square feet of it on Twin Peaks. They also use a lot of herbicides – Garlon (triclopyr) and Stalker (imazapyr) for the purpose and to fight other plants that they don’t want there. The ongoing use of toxic herbicides, in addition to being bad for the environment might not be much good for the butterflies either. In a study on Metalmark butterflies [Stark_2012 – Metalmark butterflies and pesticides], researchers found that triclopyr and imazapyr reduced reproductive success by 24-36%. This entry was posted in Environment and tagged mission blue butterfly, Twin Peaks. Bookmark the permalink. Thanks to all of you who continue to do habitat restoration work in SF. And thanks also for your thoughtful reporting about the mission blues. As a mbb monitor at Milagra Ridge, I have often wished we could see more of the butterflies as we walk our thirteen transects and count, but since the GGNRA manages the land, we depend on the native population without introductions from elsewhere. While the idea of reintroduction in SF has been discussed for at least 25 years, it seems a shame that the healthy San Bruno Mountain population has provided so many sacrificial individuals. 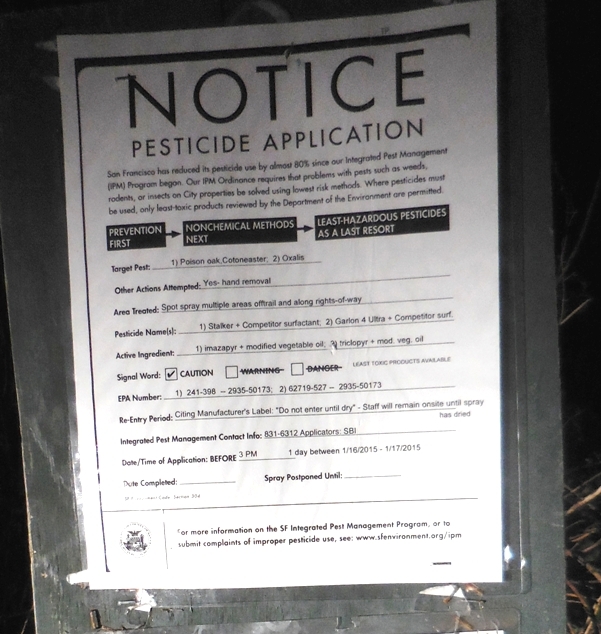 SF Rec and Park — Please stop using herbicides – they are terrible for birds and bugs. Instead, please hire low-cost labor to remove weeds instead. This has at least 3 benefits: 1) young people and other laborers get some day work; 2) bugs, birds and plants do not endure the added insult of poisonous herbicides, and 3) hard to measure health benefits for wildlife and people.